Conium maculatum (poison-hemlock) is a biennial forb (family Apiaceae). Poison-hemlock has spread throughout California in areas below 5,000 feet (1,500 m) elevation, excluding the Great Basin and Desert provinces and is commonly found in dense patches along roadsides and fields. It also thrives in meadows and pastures and is occasionally found in riparian forests and flood plains, but prefers disturbed areas. All parts of poison-hemlock are toxic to humans and animals when ingested; handling plants can cause contact dermatitis in some people. 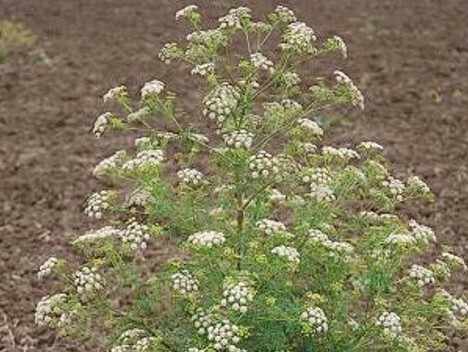 Poison-hemlock can spread quickly after the rainy season in areas that have been cleared or disturbed. Once established, it is highly competitive and prevents establishment of native plants by over-shading.